INTERNATIONAL BRIDGES - TO U.S. Creating your personal traveling routes: You may create an unlimited number of unique travel profiles—each travel profile will send updates based on current traffic conditions along your route of travel. You may receive these alerts via text message and/or email. Login to access your travel routes and favorite cameras. Enter an address, or get the weather at your at your current location. Enter your email address and your password will be emailed to you. Select a security question and enter an answer that can only be answered by you. This will be used to help find your password in the future if you forget it. Mothers maiden name? Childhood nickname? Favorite childhood friend? Oldest sibling’s birthday? Sixth grade school? Childhood phone number? Oldest cousin's name? First stuffed animal? Town parents met? Please check your email for instructions to verify your email address. An error occurred during the registration process. An administrator has been notified. Please try again later. Thank you for visiting the website of the Niagara International Transportation Technology Coalition (NITTEC). This website is designed to make it easier and more efficient for individuals and stakeholders to interact with NITTEC. NITTEC recognizes that it is critical for users to be confident that their privacy is protected when they visit NITTEC's website. None of the information automatically collected by NITTEC is deemed to constitute personal information, and such information is used to improve this website's content and to help NITTEC understand how users are interacting with the website. This information is collected for statistical analysis, to determine what information is of most and least interest to our users, and to improve the utility of the material available on the website. In using this website, you consent to NITTEC’s collecting and using such information as set forth herein. When you create an account on this website, you must also provide NITTEC with your email address, mobile phone carrier, mobile phone number and other information. This information will be used by NITTEC for login verification and to send any notifications requested by you, and includes personal information. NITTEC will (1) use commercially reasonable efforts to protect your personal information from loss or unauthorized access, disclosure or use, and (2) maintain your personal information only so long as it is used for the purposes for which you provided it, or if longer, as otherwise required by applicable law or policy. When NITTEC disposes of your personal information, it will do so in a manner such that it cannot be accessed by third parties. In creating an account on this website, you consent to NITTEC’s collecting and using such information as set forth herein. No information collected by NITTEC will be used for commercial marketing purposes, and NITTEC is not authorized to sell or otherwise disclose the information collected from the website for commercial marketing purposes. When you use a location-enabled NITTEC service, we may collect and process information about your actual location, such as GPS signals sent by a mobile device. We may also use various technologies to determine location, such as sensor data from your device that may, for example, provide information on nearby Wi-Fi access points and mobile towers. Location information will be used by NITTEC to customize maps for you, provide driving directions or offer other location-aware features. This website and the information it contains are provided as a public service by NITTEC. This system is monitored to ensure proper operation and to verify the functioning of applicable security features. Anyone using this system expressly consents to such monitoring. Unauthorized attempts to modify any information stored on this system, to defeat or circumvent security features, or to utilize this system for other than its intended purposes are prohibited and may result in criminal prosecution or civil liability. NITTEC makes no claims, promises, or guarantees about the accuracy, completeness, or adequacy of the contents of this website and expressly disclaims liability for errors and omissions in the contents of this website. No warranty of any kind, implied, expressed, or statutory, including but not limited to the warranties of non-infringement of third party rights, title, merchantability, fitness for a particular purpose and freedom from computer virus, is given with respect to the contents of this website or its hyperlinks to other Internet resources. Reference in this website to any specific commercial products, processes, or services, or the use of any trade, firm, or corporation name is for the information and convenience of the public and does not constitute endorsement, recommendation, or favoring by NITTEC. Information presented on this website is considered public information and may be distributed or copied. NITTEC shall have the unlimited right to use for any purpose, free of any change, all information submitted to NITTEC via this website except those submissions made under separate legal contract or as otherwise set forth in this policy. NITTEC shall be free to use, for any purpose, any ideas, concepts, or technologies contained in information provided to NITTEC through any comment feature contained on this website. 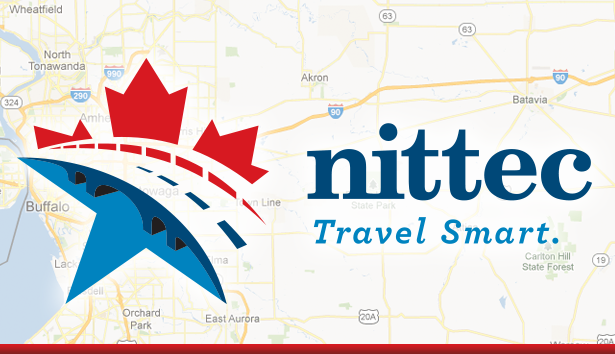 Welcome to www.nittec.org, a website (the “Site”) provided by Niagara International Transportation Technology Coalition, (“NITTEC”), and the mobile app made available on the Site or otherwise by NITTEC (the “App”). Your use of the Site and the App is at all times subject to the following terms, and you are deemed to have accepted these terms by using the Site or the App. You should review these terms carefully, and be sure you understand them, prior to using the Site or the App. If you do not agree to these terms, you must immediately exit the Site and not use the App. The Site, the App, all content on the Site or the App (collectively "Content"), plus all copyrights, trademarks, service marks and other intellectual property rights in the Site, the App and the Content (collectively the “Resources”) are owned, or licensed from third parties, by NITTEC. You are not granted, whether expressly or implicitly, any license or other right to access, copy, create derivative works of, distribute, modify, publish, transmit or use the Resources, unless set forth in writing signed by NITTEC or its licensee (as the case may be) or expressly set forth herein. Any such access, copying, creation of derivative works, distribution, modification, publication, transmission or use not expressly permitted pursuant to the immediately preceding sentence is prohibited. The Resources are only offered to provide you with real-time information relating to traffic, weather or other conditions affecting transportation in Buffalo and Western New York. You may only access, print and use the Resources for purposes that are not unlawful, fraudulent, harassing, indecent, obscene or offensive. NITTEC reserves the right, whether with or without notice, and in its sole discretion, to modify the Resources, terminate any person’s use of the Resources or discontinue all or any portion of the Resources. THE RESOURCES ARE PROVIDED "AS IS" AND WITHOUT ANY WARRANTY OR REPRESENTATION OF ANY KIND, WHETHER EXPRESS OR IMPLIED (INCLUDING, BUT NOT LIMITED TO, THE IMPLIED WARRANTIES OF MERCHANTABILITY AND FITNESS FOR A PARTICULAR PURPOSE). TO THE MAXIMUM EXTENT PERMITTED BY APPLICABLE LAW, NITTEC SHALL NOT HAVE ANY LIABILITY FOR ANY CONSEQUENTIAL, DIRECT, INCIDENTAL OR OTHER DAMAGES WHATSOEVER ARISING FROM OR RELATED TO YOUR USE OF, OR INABILITY TO USE, THE RESOURCES, HOWEVER CAUSED, REGARDLESS OF THE THEORY OF LIABILITY (INCLUDING, BUT NOT LIMITED TO, BREACH OF CONTRACT, TORT OR OTHER), AND EVEN IF NITTEC KNEW, OR SHOULD HAVE KNOWN, OF THE POSSIBILITY OF SUCH DAMAGES. HOWEVER, IF A COURT SHOULD DETERMINE THAT THE IMMEDIATELY PRECEDING SENTENCE IS NOT ENFORCEABLE FOR ANY REASON, NITTEC’S AGGREGATE LIABILITY SHALL BE LIMITED TO ANY DIRECT DAMAGES ACTUALLY INCURRED BY YOU. You must indemnify, defend and hold harmless NITTEC, its members and other affiliates, and its and their employees, officers and other agents, from all costs, expenses, damages, fines, liabilities, losses, penalties and other payments (including, but not limited to, all reasonable fees and disbursements of counsel to NITTEC) in connection with (a) your accessing, and using, the Resources, or (b) your failing to perform any obligation pursuant to these terms. If you believe that any Content infringes your copyright, you must in writing (a) identify for NITTEC the copyrighted work that you believe has been infringed, (b) identify for NITTEC the Content that you believe infringes the copyrighted work referred to in clause (a) of this sentence, (c) provide NITTEC with your name, mailing address, e-mail address and daytime phone number, and (d) state that (i) you have a good-faith belief that the Content identified in clause (b) of this sentence infringes the copyrighted work identified in clause (a) of this sentence, (ii) under penalty of perjury, all information being provided by you in such writing is accurate and (iii) you are either the owner, or authorized to act on behalf of the owner, of the copyrighted work identified in clause (a) of this sentence. Such writing must also be (a) signed, either manually or electronically, by the owner, or someone authorized to act on behalf of the owner, of the copyrighted work that you believe has been infringed and (b) sent to NITTEC at webmaster@nittec.org. Whenever possible, each provision of these terms shall be interpreted to be effective and valid under applicable law. If, however, any such provision shall be prohibited by or invalid under such law, it shall be deemed modified to conform to the minimum requirements of such law, or if for any reason it is not so modified, it shall be prohibited or invalid only to the extent of such prohibition or invalidity without the remainder of such provision, or any other provision of these terms, being prohibited or invalid. These terms may only be revised (a) in a writing signed by you and NITTEC and (b) unilaterally by NITTEC from time to time by posting the revised terms on the Site, with the revised terms taking effect immediately upon such posting. It is your responsibility to periodically check these terms on the Site for revisions. Your use of the Resources following the posting of any revisions to these terms on the Site will be deemed an irrevocable acceptance by you of such revisions. These terms (a) shall be governed by, and interpreted and construed in accordance with, the laws of the state of New York, without regard to principles of conflict of laws, and (b) contain the entire agreement, and supersede all prior oral and written proposals, understandings and agreements, between you and NITTEC with respect to the Resources. Please specify your mobile phone carrier and phone number below. 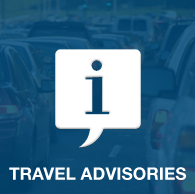 This information will be used to send text messages about travel advisories that may impact your personalized routes, such as your work commute. 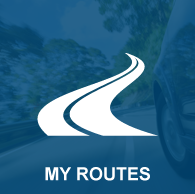 Text messages will only be sent when you define one or more routes. Below is a series of frequently asked questions, conveniently grouped into categories. If you still cannot find the answer to your question, please send an email to webmaster@nittec.org and we will be more than happy to assist you. What information is provided by NITTEC? NITTEC collects and disseminates real-time traffic information for the Buffalo-Niagara Corridor. This area encompasses the major highway networks throughout Western New York and Southern Ontario, Canada, and includes the border crossings. In addition, NITTEC reports on incidents, construction activities, and events impacting the traveling community. The information being reported by NITTEC comes from a variety of sources. For the most part, NITTEC identifies traffic incidents using the real-time tools installed throughout the area’s transportation network. These tools include cameras and speed sensors. Other information comes about as a result of collaboration with various transportation and enforcement agencies that provide information about incidents or activities that affect travel in the area. What does “real-time information” mean? Real-time information includes data that is delivered immediately upon collection. So, in the case of the camera images on NITTEC’s website, the imagery being displayed is current. It should be noted that there can be a lag due to refreshing rates. For example, camera images are refreshed every 1-3 minutes. How does NITTEC's reporting differ from the travel information on the radio or television? NITTEC is an information source that complements radio and TV broadcasts. In fact, much of what is reported by the news media outlets is sourced from NITTEC. With NITTEC you can expect to receive more detailed, current, and route-specific traffic information than is provided in a short, general, traffic news slot, and you can get the information whenever you need it. What is NITTEC's role in winter road management? NITTEC’s role involves monitoring of conditions and disseminating of information to the various agencies for their consideration and use in maintenance action. What options are available for accessing NITTEC information on traffic conditions? 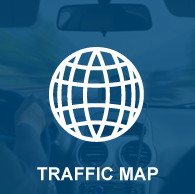 NITTEC maintains a website packed full of real-time traffic information, tools, and resources. Through the website, users have access to interactive traffic maps and can view live camera feeds, traffic speeds, and highway message sign data on the major expressways. In addition, current travel advisories and construction information is posted along with links to numerous tools and travel-related resources. To accommodate the ever-increasing portability of mobile devices, NITTEC maintains a mobile website containing most of what is found on the full website but pared down for mobile use. The traffic map and highly utilized real-time camera feeds, traffic speeds, and message sign data are available through the mobile device. MYNITTEC is a personalized alert system that allows a subscriber to receive customized, real-time travel information through text messaging and/or email. MYNITTEC requires an account be set up and is available through the website. Is there a way I can be notified when an alert occurs? Yes. The MYNITTEC tool is required to set up personalized alerts. MYNITTEC can send alerts via email or text messaging. MYNITTEC is available through the website. Why doesn't an accident I saw appear on the map? NITTEC reports on traffic-related incidents primarily on the interstate highway and state highway networks once they have been verified and include a lane closure. NITTEC also reports incidents on the local highway network as they are reported through local dispatchers or transportation agencies. The information on the NITTEC website appears dated. Why? To see the latest information on the NITTEC website, make sure your web browser is set to refresh pages automatically. Otherwise, the version of a page stored on your hard drive from your last visit will be loaded. Also, during a session select Refresh or Reload from your browser's menu or press the appropriate toolbar icon. What are the cameras along the highway used for? 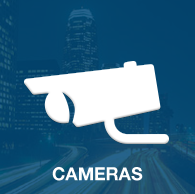 The cameras help our Traffic Operations Center (TOC) verify traffic conditions and manage the roadway network by disseminating pertinent traffic information. How often are camera images updated? The camera feeds are live; however, the refresh rate generally varies between 1 minute and 3 minutes, depending on the camera source. Why, for certain cameras, does the website indicate, "Image Not Available"? Camera images are not available if a camera is not functioning properly or there is a problem with the connection. How can I tell which direction the camera is facing? From the map view, click the camera icon for the camera you are interested in viewing. A window will open with the live camera image. In the bottom left corner is a pair of sample images from which to determine the camera direction of the live image. Note: The sample images are not live images. Who determines what message is put on a highway message sign (Dynamic Message Sign)? The Traffic Operations Center (TOC) Operators usually develop sign messages from a list of predefined message content. On rare occasions, special or otherwise unique circumstances warrant a deviation from the predefined message content. The highway message sign (Dynamic Message Sign) is blank. Is the sign working? Most likely. Unless a message sign is off for maintenance reasons, a blank sign means that there is no traffic information or public service announcement to report at this time. What speed do the color-coded overlay speed links represent, and how often are the reported speeds updated? The color codes for the speed links represent the average travel speed on the roadway based on current conditions. Refer to the color code legend for the corresponding speed ranges. The speed links are updated approximately every 60 seconds. On the Speed Links page, what does "No Data" and “No Instrumentation” mean? “No Data” means that the device that measures the speed is not functioning. “No Instrumentation” means that the equipment needed to measure speed is not installed within the section of roadway in question. When is the construction information updated? Information on construction activity is posted on the website typically a week in advance of the construction start. 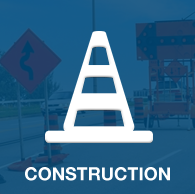 Updates to ongoing construction activities are usually made on Friday of each week as necessary; in cases of significant changes, updates are made immediately. Where can I find out about travel conditions on regional or county roads? NITTEC works in collaboration with emergency and transportation agencies to publish incidents and alerts in areas beyond the major highways–on county and local roads–only when there is an impact to traffic. This information can be seen by going to NITTEC’s traffic map and turning on the “Incidents and Alerts” icons from the map legend. Where can I find out what the current travel conditions are like during periods of inclement weather? Winter road condition information is available for state highways and interstate highways through the www.511NY website. Select “Traffic and Transit Conditions Map” from the main menu; then select the “Winter Road Conditions” button. Conditions are updated at least every four hours during winter months and more frequently during storms. Additionally, the Thruway Winter Traveler Advisory is available from November through March, providing travel conditions specific to the Thruway’s statewide system (e.g., I-90 and I-190 in Western New York). It can be accessed online or by toll-free telephone at 1-800-THRUWAY (1-800-847-8929). Where can I get information about crossing the US/Canada border? 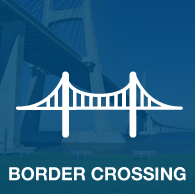 There are four crossings between the US and Canada in Western New York, the facilities of each being maintained by one of two authorities: Buffalo and Fort Erie Public Bridge Authority and the Niagara Falls Bridge Commission. Each authority offers general and specific border crossing information at its respective bridge and can be accessed at www.peacebridge.com and www.niagarafallsbridges.com. Please click the link in your email, or resubmit the forgotten password form.